In front of a sellout crowd, the home team got its last glory from their championship year and managed to overcome penalties and a sluggish first period to win 4-2 over the Iowa Wild on opening night. In a pregame ceremony, the Stars raised four banners to commemorate their 2013-14 season, which culminated in a Calder Cup championship last June. "It was obviously a special moment," said Justin Dowling, who had a goal and an assist tonight. "I've never been a part of something like that. I know it was special for the other guys too. It was good for the organization and the fans too." Coach Laxdal was satisfied with the effort on opening night, "The guys had a great effort tonight. You're always going to be a little unclear what you'll see [on opening night]. I thought our guys came out and picked up where they left off last year." Jussi Rynnas got the start and picked up his first win in green and gold. Julius Honka and John Klingberg both scored their first AHL goals on the power play as the home side outshot Iowa 36-22. On the negative side, the Stars gave up eight power play opportunities. Laxdal wasn't worried about the number of penalties for his squad. The Wild drew the exact same number of minors. "It's early in the season so the referees want to try to establish a standard." 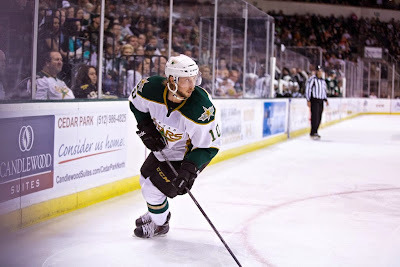 Brendan Ranford added, "We're so used to playing in the playoffs. Some of those plays aren't penalties; they're just hard plays." The Texas Stars started their title defense with a less than stellar first period, perhaps a hangover from the banner raising ceremony. The only goal of the period came off the stick of Tyler Graovac, who split the defense and went five hole on Jussi Rynnas at the halfway point of the frame. It was a power play goal with Matej Stransky in the box for goalie interference. Coach Laxdal indicated it was a bit of a feeling-out period, "It's the first game of the season, and guys have to find their way a bit. Iowa played last night, so they know exactly where they're coming off." The home-side offense got started in the second period. Reigning Rookie of the Year Curtis McKenzie found twine on a greasy play at the net seven minutes in to tie things. Curtis celebrated the goal on his back after cramming it in on the left post and falling over in the scrum. It wasn't a power play goal on the board but came 12 seconds after a power play had ended for Texas. Justin Dowling scored a pretty goal just a few minutes later off some nice work by Jyrki Jokipakka to keep the play onside and by Brendan Ranford to get the puck to the right spot. Neither of them got assist though as Ranford's pass to Glennie went on to Maxime Fortunus at the right wing half wall. Dowling deflected Fortunus's incoming pass behind John Curry for the go-ahead goal. "It was a great play by Jokipakka to start it all off," said Ranford. "Even though he didn't get an assist, he kept it in on the wall. I just tried to make a play to the middle." The period scoring was capped by a Texas Stars power play goal. That's rather notable since the Stars had spent most of the second period on the penalty kill. Julius Honka got his first professional goal with under a minute left in the middle stanza. From the point with Brendan Ranford screening in front, the Stars took a 3-1 lead off the stick of the rookie 18-year old. Honka had a few moments where the speed of play seemed to overwhelm him, but overall he was solid. Honka said, "I got used to how you have to move your feet and how fast they are coming at you, so it wasn't that bad." The Stars continued the march to the penalty box in the third period, taking one early and one late. Iowa did score to cut the lead to 3-2 for Texas early in the frame. However, on the power play late, John Klingberg scored his first AHL goal on a powerful one-timer off a cross-ice pass from Travis Morin. Texas held on through an Iowa 6-on-4 and moved to 1-0 with five days' rest ahead. Looking at the team picture it makes me wonder how awkward the ceremonies were a few years ago when Norfolk won the Cup and they switched affiliation in the off season so the players that were on Syracuse the year before were celebrated at the ceremony. As for the game, watching this team two things come to mind. 1st is I can't imagine players that weren't here over the last couple years but most specifically the last half of last year and the playoffs not being in awe at the ability for this team to control the puck, they still make the opponent look like a "AA" team, man they just get to every lose puck and seem to be able to connect passes from anywhere and to anywhere. 2nd is Laxdal has to be talking to his wife about now telling her he will be in the NHL in 2-3 years, this roster is so good anyone who can tell the difference between a hockey stick and baseball bat can get 90+ points and deep into the playoffs. It was an awesome opening night. Everyone was putting in 100 percent effort, there were so many times when the puck almost came out of the offensive zone but we hustled and kept it alive. The forecheck and backcheck hounded Iowa all night. I was surprised Gaunce and Meech got split down the middle on the first goal, but I'll chalk it up to a one time breakdown. The top two lines were on fire. They possessed the puck so well, I thought they'd never give it up at times. The bottom two lines played great as well, especially Faksa and Henderson. Both of them made a ton of solid defensive plays and the former took runs at everyone he could. Klingberg looked like he knew exactly what he was doing, I'm excited to see him progress as the season goes along more than anyone else on the team. Honka was decent, I had high hopes and I feel a bit let down. There was one time he had the puck behind his own net waiting for the play to develop and he was absolutely frozen. It felt like an eternity watching him stand there as everyone skated in circles. He tried to take a giant slap shot with no room only to see it blast off Graovac's shin and to see him go on a breakaway. He made some nice passes and he can skate with the best of them, but he's raw and he has plenty to work on. Experience is all he needs, I'm not worried. I agree Honka needs some work. I know a lot of folks were excited to see the 1st round prospect here in Texas, me not so much. Nothing against him but I don't want it to be a trend where we start seeing more 18-19 year old guys and less established players or players who developed their games in the Juniors. 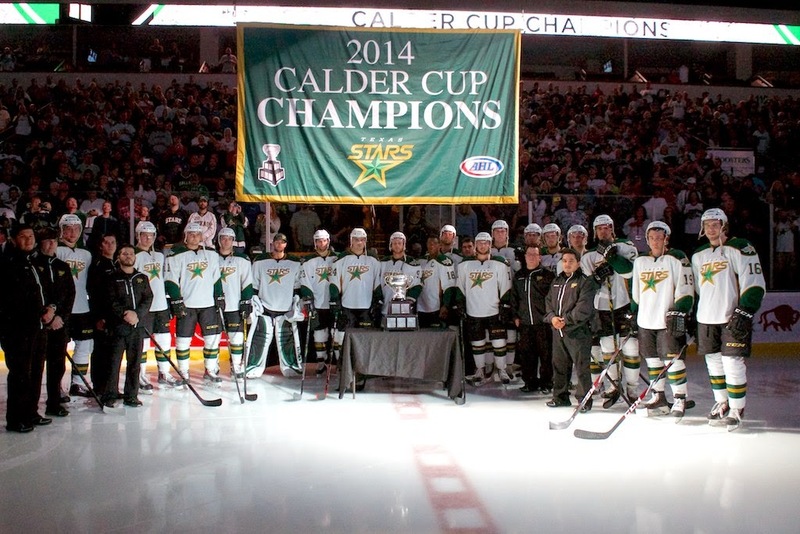 Congratulations on the Calder and I hope you enjoyed your banner raising as much as we did in 1999 and 2003. Family obligations kept me from visiting you last season, but with those (sadly) in the past I hope to be joining you a few times in Cedar Park or San Antonio this season (along with checking out all the future retirement options in your neck of the woods). What a great game! We had two friends in town from California, one of whom had never seen a live hockey game, the other had been to three NHL games. Both of them LOVED IT! They were totally blown away with how much fun a Stars game is, and both couldn't believe how cool it was that the entire crowd was so totally into the team. Whatever they are doing in Cedar Park should be emulated, because it was a fantastic night! I was really surprised Campbell didn't goaltend most of the night. Is he injured? I wondered the same thing (why Jussi over Jack for game 1)? The next game in OKC will help, by seeing who starts there. My take would be that Jussi played better in to this point and Jack is not hurt or sick (since he dressed and was back up). If you remember last year, with that coaching staff, we almost strictly rotated goalies. I am more of a play-until-you-lose-guy and then rotate goalies, but what the staff did last year worked very well. It appears we have two #1 goalies like we did last year rather than a starter and backup (#1 & #2). Coach Laxdal said he will start each one once in the first two games. Therefore, Jack will get a start in OKC.